Your can make a difference in your company. Our shows will bring a new energy into your company, that is great for enhancing the spirits of both employee and their families. We divide your group of children into various groups and rotate around so that everyone gets a chance to experience everything. The possibilities are endless. Alpha can create an event for the day at your work. Or we can be booked as part of your annual celebrations for the company. There is no better entertainment for families than an Alpha show. Below is a sample of some of the activities we might run with your students. 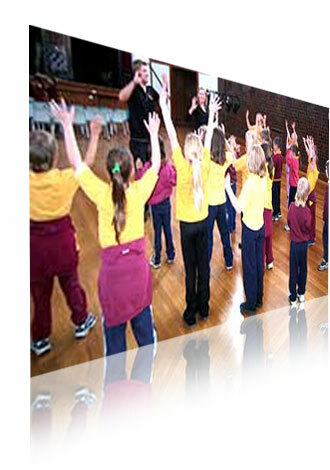 Each workshop is customised to your company, the specific show, and your specific group of children. A playful discussion on what the core message of the show is and how to get the most out of the show. Interactive and enlightening, prep your students to be inquisitive and use the opportunity to ‘pick our brains’. After all, we dedicate our life to this stuff! One of the more popular activities, students get to take a full tour backstage and around the set, to learn the secrets of the effects and tricks, to play with the lights and sound and even get to fill the entire venue with copious amounts of fog, just to annoy the teachers. The children will participate in a craft activity specific to the show being performed later. Pick a side (Hunchback of Notre Dame). Before the show we can run an exercise where the children pick which character (the good guy, Quasimodo, who is good brave and kind, or the bad guy, Archdeacon Frollo, who is evil and nasty) they wish to be with. During the show, most children will be booing the Archdeacon but he’ll have a few fans as well! The only trick is, at the end, the children have to be willing to suffer the same fate as whomever they picked at the start! (Hint: The Archdeacon falls asleep for 100 years, Quasimodo gets one wish, whatever he wants, and lives happily ever after!). Come dressed up ready for the ball in Cinderella. Our character of Beady the mouse also loves to be brought cheese, and if you try it after the show you can even get Baldrick to do whatever you like just by the click of your fingers! Learn the song and dance to our finale song that’s at the end of all our shows. Most children get a real kick out of being as good as this as we are and having the chance to join in at the end. All of our shows have a sword fight or stage combat sequence of some sort in it. This creates drama and tension and we find it’s an essential part to engage our audiences. Of course, students like to recreate ‘fights’ in the playground – so it’s great to be able to show them the safe way to do it, like we do, and the various techniques for stage combat. The company employs the talents of a highly respected fight choreographer who worked on Star Wars, so you students are getting the best information on this fascinating art form, armed with actual knowledge if they ever chose to go into the theatre industry in the future. Have fun in the activity games. There’s the Get-ready-for-the-ball relay race and the magical transformation game where your group becomes the castle or the forest! In this show there are a number of spells that Fairy Floss needs help with from the audience! The children can learn the spells before hand and be ready to do them during the show. In this show there is also the need for a volunteer from the audience to be in charge of getting everone in the audience to be as loud as they can to warn Sleeping Beauty if she’s in danger! Boo the Villain / He’s Behind You! Booing the Villain is a well known tradition in our shows as well as in theatre for centuries! We use some of the old traditions, and some of our own ideas, to prepare the children for making the most out of the show experience, by familiarising them with the various responses possible when the Villain is going on about how handsome or beautiful they are, or when one of the characters is hiding! Great for the younger children. Benefits of an Alpha corporate event day. The more fun everyone has in your workplace, and the more you show care for their lives outside your work, the more likely you’ll have happy staff who want to stay working for you. It will inspire a massive boost in staff morale and enthusiasm. More performers than any other group. A total of SIX actors playing TEN or more characters. The 6 actors are also available for the full workshop activities. Alpha can provide additional performers (beyond the base cast of 6) to run activities and make the event even more special. Big sets, that have different scenes, backdrops and staging. We also use full theatre lights, fog machine effects, and state-of-the-art Sennheiser and Countryman earset/headset microphones. We know exactly what entertains children, as well as the importance of keeping the adults entertained just as much! All shows are movie length – the perfect length that children are accustomed to. All of our shows run from 80 to 90 minutes. Our shows are without a doubt 100% proven to appeal to a much higher age group – from 3-4 years up to 14 years old! And parents love it too! Compare that to a children’s band style group which caters for 1-5 year olds, or other children’s shows that lose the age 9 and upwards. Alpha’s shows include the audience every step of the way, and can be even more enhanced with a pre-show workshop. The adapted songs that fit perfectly into the stories, that children and adults know and love (and can sing along with!). And we keep producing more shows! And we keep running the original ones, so you have a greater choice and we can come back every quarter. Buy a show or workshop for your corporate event today! Call 03 9999 6060 now.